From frozen: Convection oven: Put an even layer of nuggets on a,tinplate. Heat at 200°C for 15-20 minutes. 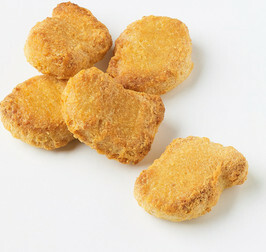 Do not use steam when, heating the nuggets, it prevents the surface of the nugget to g,et crispy. Chicken (44%), water, WHEAT flour, corn flour, modified WHEAT starch, salt, stabilizer E450, acidity regulator E500, rapeseed oil, dextrose, yeast, yeast extract.